This COBIT 5 interactive guide addresses the knowledge encompassed by COBIT 5 Governance of Enterprise IT and related content. It focuses on GEIT and implementation of IT governance in enterprises. The test therefore is intended to test viewers’ knowledge about implementation of GEIT in the scope of COBIT 5. The number of correct answers to theoretical questions classifies modelers on a scale from 0 to 100%, based on the achieved points. 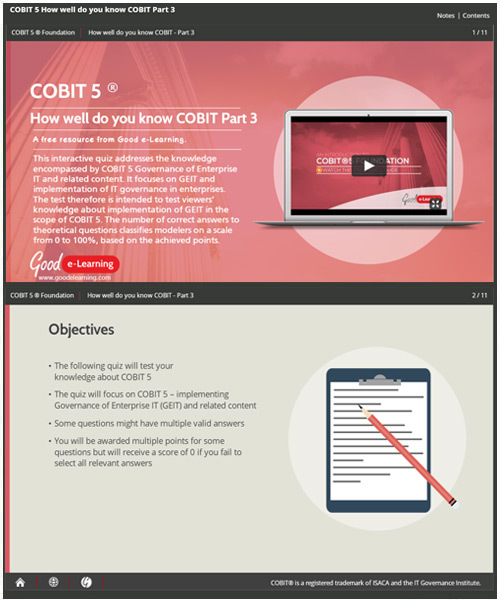 Download this free COBIT 5 learning resource and you’ll also get instant access to over 550+ business & IT learning resources.